In order to collect money for a charitable organization called Simon Community, the classes FOS11Sb and FOS12Sb sold waffles from the 6th to the 8th of December 2017. This supported organization helps homeless people in Ireland. On our class trip to Dublin in May 2017 we saw that many people needed help, because they live on the street and haven’t got enough food. We found out that this organization gives them little packages with groceries and tries to help them into a settled life, as well. But because Simon Community needs money to finance these projects and we believe nobody should have to sleep rough, we discussed a way to help them. 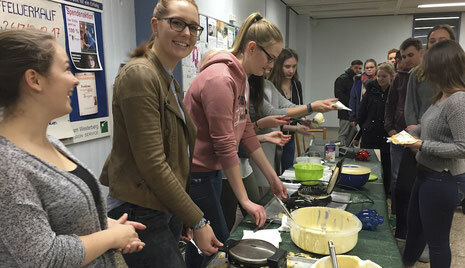 Therefore, we decided to sell waffles during the school breaks, so students and teachers got the chance to buy them for 50ct per student and 1€ per teacher. Everyone could also put an extra donation into our collection box. 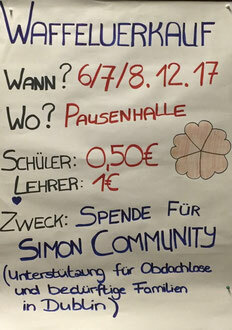 With the collected money we want to support the above-mentioned charitable organization that offers homeless people a few nights in a shelter, which is especially important now in winter. We also made paper stars with Christmas greetings that will be handed out to the homeless as a small gesture to make them happy, spread some joy and show that someone cares. 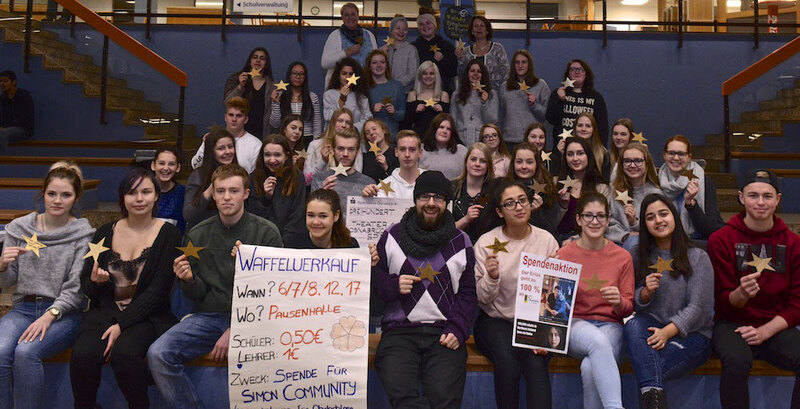 All in all, we managed to collect 300€ with this fundraising project. Thank you to everyone for helping us with the donations and support! Next year in Summer the 11th grade is going to go to Dublin and is also planning to visit Simon Community.